It took us an hour to arrive at our usual parking place. There were two other cars, and we passed groups of walkers returning to them. We would be the last to venture forth. Inside the estate walls there were sounds of children in the playground and other groups walking in the woods. The grounds of the country house where ages ago Brideshead Revisited was filmed, must be open but we kept to the signposted footpaths outside. Around us were typical Yorkshire dry stone walls topped with moss and a touch of frost, wooden field gates and tree skeletons shivering slightly against the pale blue skies. The land was covered in a light white carpet of frost that crunched under our boots. 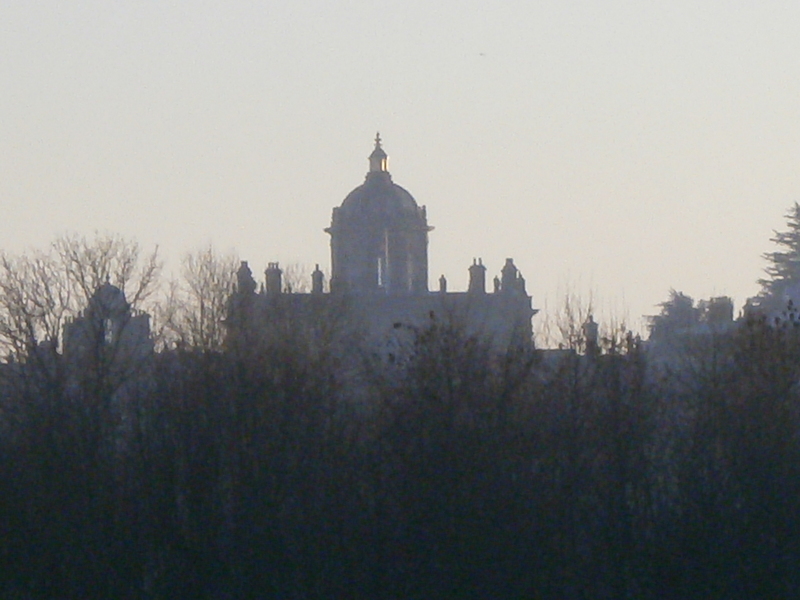 Mist was rising by the hill with the silhouette of a dome and towers – Castle Howard looking over us. bridge. 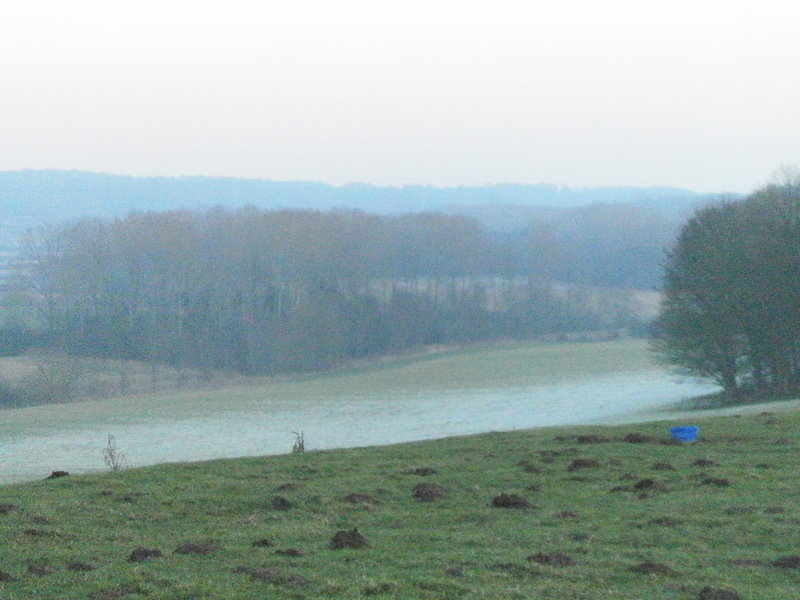 On our right the sun was setting in red fury and beyond us fields were still brushed frost white. Where it had melted under the trees and by the hedgerows there were sheep, snug as they toddled along inside their heavy fleeces. Walking fast on my own is when I turn my thoughts to a particular writing problem. In my return to the first draft, I’m devoting myself to pace and character. Nicholas (name chosen from Nicholas Nickleby) is particularly troubling me. He’s a genius, and inventor and the main protagonist, but I’m not happy about his voice. I think of his specific vocabulary. Not easy. Different sentence structures perhaps? Alone, one can try them out loud. By the time we’re back at the car it’s twilight and the dome is shrouded in dusk. I’m happier with Nicholas and jot a few ideas down in the car. One hour, and we’re back for hot mince pies and P D James’s Death comes to Pemberley.I can’t believe it! 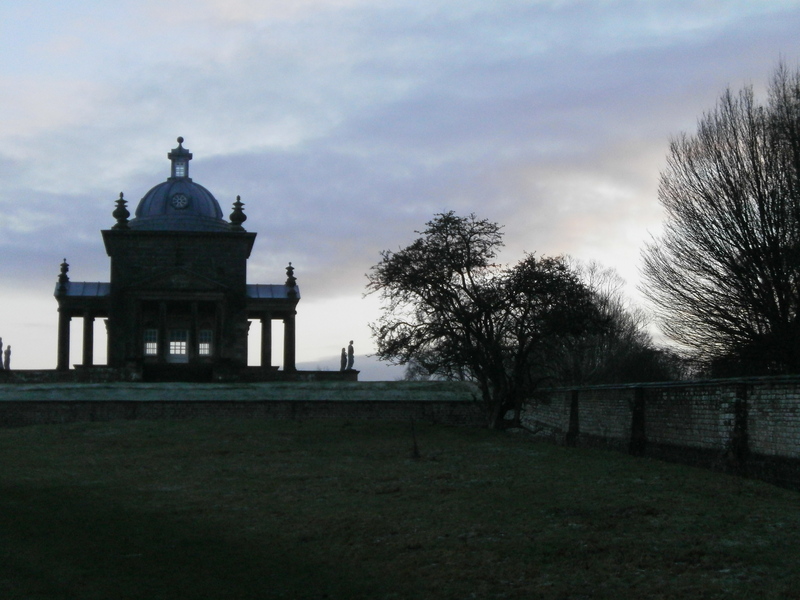 The outside of Pemberley is Chatsworth, but the interiors are mostly from Castle Howard, and Elizabeth has a scene in the Temple of the Four Winds – just where we’d been that afternoon!